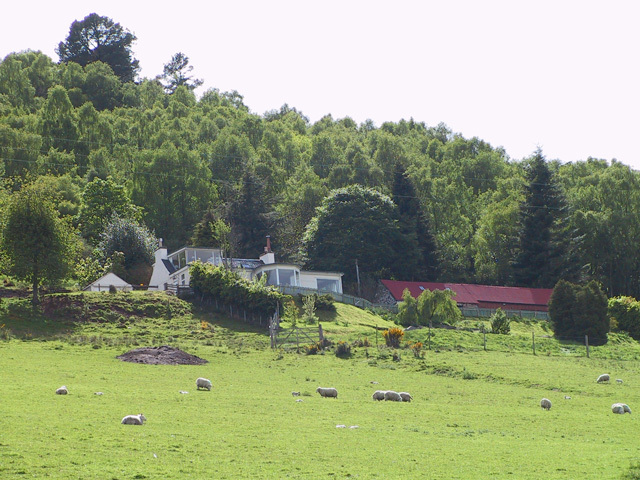 Creag Iolaire Self Catering Cottage, Borlum Farm, Loch Ness. Wilderness cottages are thrilled to be able to offer you this traditionally built self catering cottage overlooking Loch Ness at Borlum Farm, Drumnadrochit. Creag nah Iolaire - well named, the 'Hill of the Eagles' self catering holiday cottage is perched up on the side of the hill at Strone, high above the Loch Ness side village of Drumnadrochit and has unique and breathtaking views over Loch Ness and up Glenurquhart to the distant mountains of Glen Affric. In fact, the view is panoramic! We can honestly say we have not seen better views of Loch Ness from a self catering cottage anywhere on Loch Ness! There isn't another cottage like it anywhere around Loch Ness, but don't take our word for it - come and experience a holiday here for yourself. You can go on lovely walks straight from your door, or just spend the week drinking in the scenery. 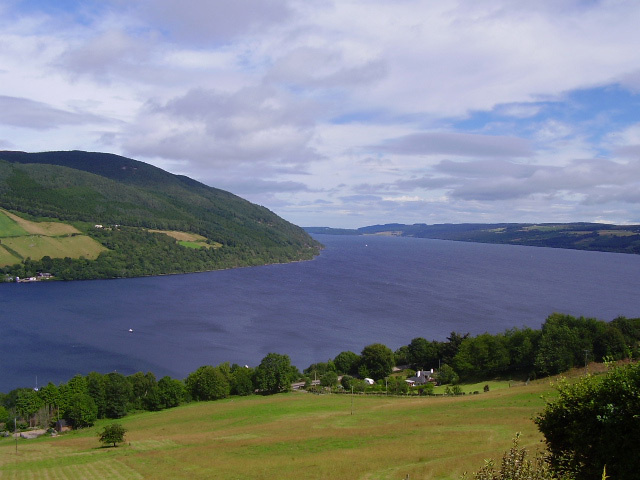 It is just a short drive to the bars, restaurants and shops of Drumnadrochit or to picnic on the shores of loch Ness. The central location of Drumnadrochit is ideal for exploring both the immediate area and further afield, with plenty of scope to take a different route each day. Inverness offers a good shopping centre, as well as golf, swimming pool, cinema, museums and theatre. Skye and the west coast are easily accessible for a day trip. The nearby horse riding centre is popular for all ages and abilities. The “Highland Riding Centre”, gives visitors the opportunity to use the excellent facilities available and take part in one of many unique rides. 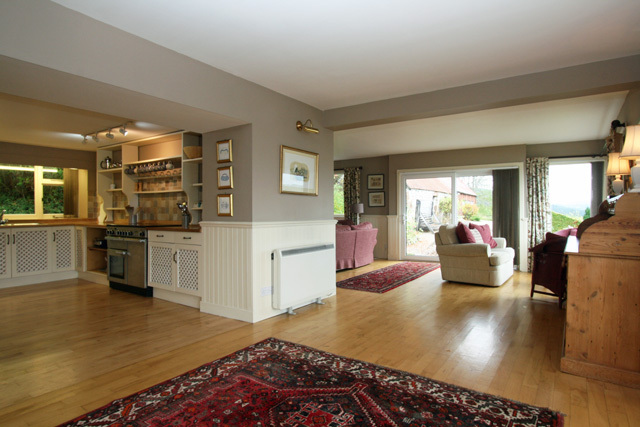 The sitting room, dining and kitchen area are open plan and are in a cruciform shape. The natural maple floor is lovely and warm and spans a large area of floor space. 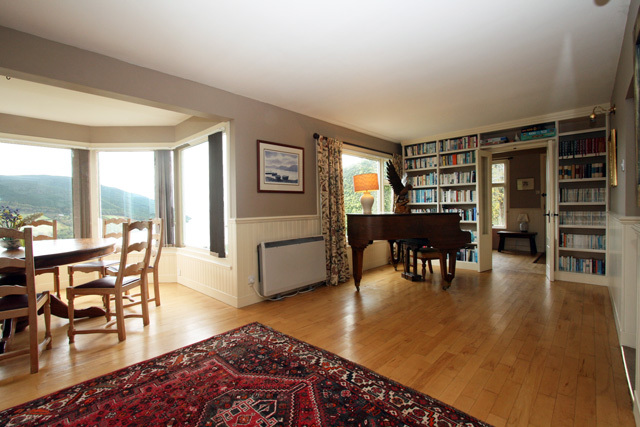 The baby grand piano is popular with musicians and the huge windows overlooking the loch and glen, for gazing out upon the spectacular vista, are popular with everyone! Kitchen is fully equipped, including microwave, washing machine, tumble dryer, dishwasher, fridge freezer, electric range cooker with induction hob, food processor etc. Ironing facilities available. Lounge with TV, DVD, music centre and video recorder make wet weather easier, although gazing at the view even in the rain is wonderful while you are warm and dry inside. There is a wood-burning stove for added atmosphere. Logs are included, coal can be obtained from the owners at cost price. 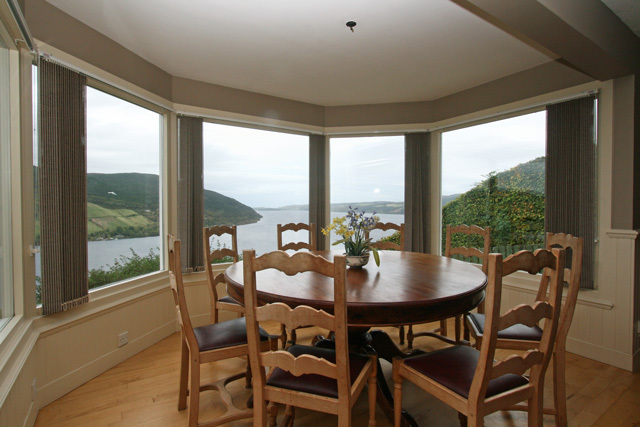 Dining area with spectacular views along Loch Ness. Double bedroom with en-suite shower room. Hair dryer. 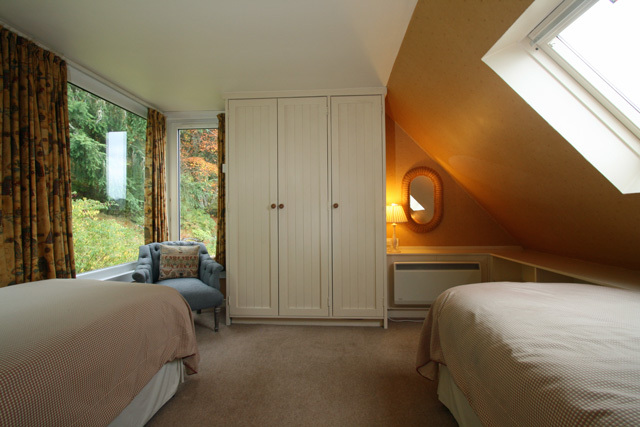 Two twin bedrooms - The larger twin has a sitting area with incredible views of Loch Ness. Bathroom with bath wash hand basin and wc. As the property is of a traditional style the staircase leading to the bedrooms is quite steep and would need to be taken with care, especially with young children and may not be suitable for the less able person. Bed linen (The owners have provided quality feather duvets and pillows for your comfort). Please note, towels are not supplied. Electricity and some logs for the fire. Heating is by off peak storage heaters. WiFi internet access, please bring your own laptop. Sorry No cot or highchair available. Stunning views of Loch Ness. Perfect place for a riding holiday! The stables were established as a riding centre in 1963. Beginners, novices and experienced riders are all welcome. Perfect place for a monster spotting holiday! Nessie spotters are welcome and you will see lots of other wildlife also. 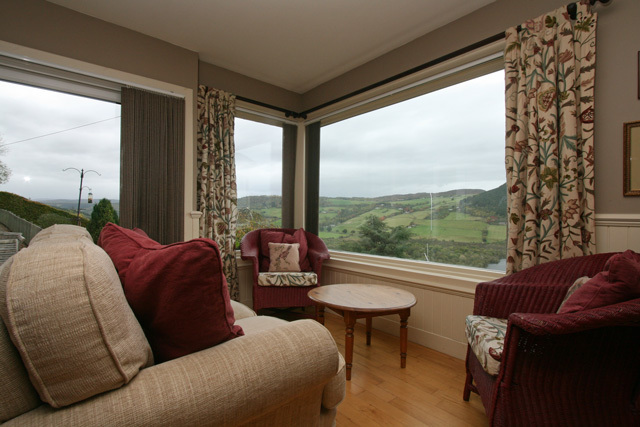 This cottage has the most amazing views of Loch Ness and the surrounding countryside. 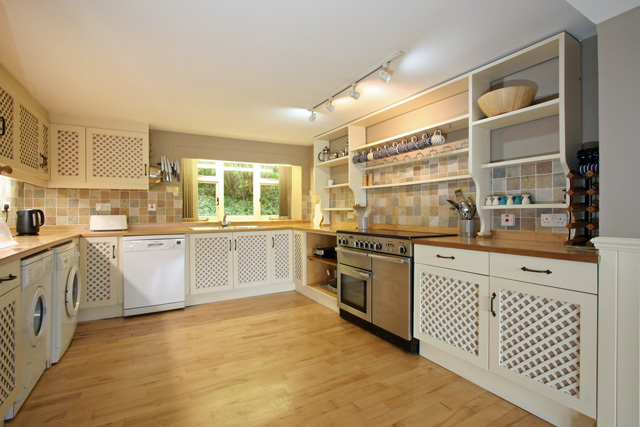 The cottage itself is spacious, very comfortable, well-equipped and was spotlessly clean. There is a perfect space for relaxing in front of the log burner in the evening, another seating area in front of a window looking out across the lake, and the dining area has the best view of them all! 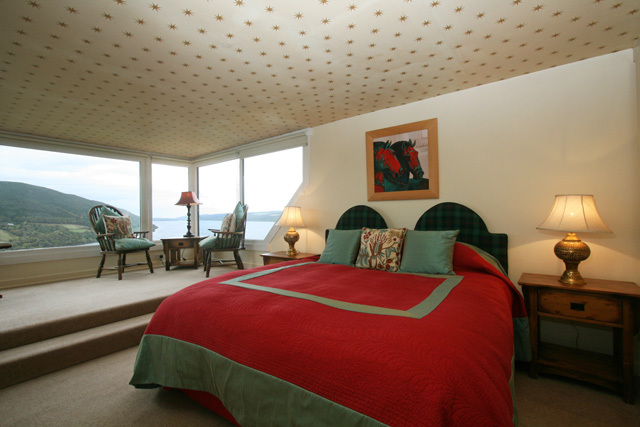 Oh that is before you get to the main bedroom and see the seating area there! Duncan gave us a warm welcome and showed us around on arrival. It's a great location for exploring the Great Glen and Glen Affric. I couldn't recommend it more highly! I am going to be honest, I really don't want to leave a good review because the cottage is so amazing, that I want to keep it all to myself. It is far beyond perfect and I didn't want to leave. The pictures online were lovely but when you actually walk into the doors, your jaw drops. It is more magnificent than the online pictures show. You will literally not want to leave. Beautiful, clean...it doesn't get any more perfect. 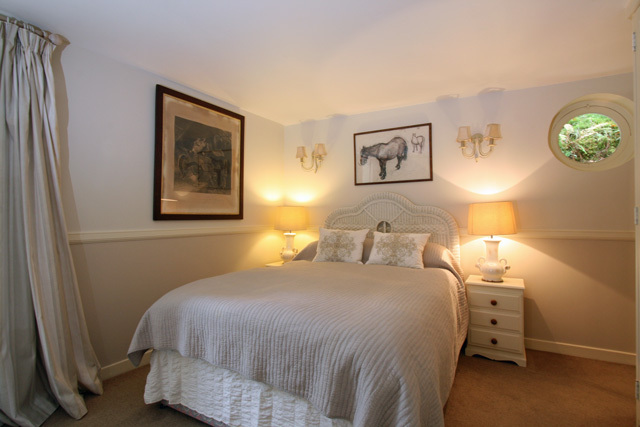 Perfect, cosy, well equipped, great location! A wonderful cottage superb location with views to die for. We found it a home from home in all respects and the privacy was very much appreciated. We found the steep track to the cottage fine as we have a 4x4 but would imagine it to be hard going in the winter but it was all part of the charm of the location. Where else can you sit in the evening eating your supper and see eagles flying over and around you? Superb. Creag nah Iolaire is the best in 10 years of holidaying in the Highlands. Just returned from a week at Creag nah Iolaire. What a lovely house and a fabulous location with the most fantastic views. Warm welcome from the charming owner too. Road not as steep as mentioned in another review, had no problem with our cars. Highly recommended if you're planning a holiday around the Loch Ness area. 23/2/10 Quality homely cottage. Situated high above Loch Ness the views from the living area and from one of the double bedrooms upstairs are breathtaking. All you need is here. Literally hundreds of books available to read from the bookcases. Note the cottage is accessed by a very steep road. Would love to return again. Highly recommended. Ray Walters. Lots of snow walks - a fun & a healthy way to spend the week in a magical location: local castle/ruin, a trip on a boat on the lake & walks near the house afforded wonderful views & photographic opportunities. Just come back from a week in the cottage. Cannot fault the fantastic views of Loch Ness but you need a four wheel drive to get up the track before you reach it! Cottage is lovely but the heating is questionable especially when you have no logs as promised for the woodburner on your first night! Dogs loved the wondeful enclosed garden and the nearby walks. The closest pub/restaurant was actually about a mile and a half away, not exactly a short walk as stated on the website! The cottage, the location and the views were all stunning. We sat for a good few hours just looking at the impressive views and looking out for the local deer. We also had a fantastic time visiting Glen Affric and Nairn. The dogs loved it too!! Cant wait to go back, hopefully in the near future. We have just returned from a fantastic week at Creag nah Iolaire, we had really great weather which was a bonus for exploring the beautiful surrounding coutryside but we would have been happy to spend all week in the cottage! Our holiday last week at Creag nah Iolaire was one of the best cottage holidays we have ever had -- superb accommodation in a stunning location. We were even, unexpectedly, lucky with the weather! We certainly intend to book the same cottage again soon for a longer holiday and have told several friends about it. Our only regret was having too little time to do and see everything that was available in the neighbourhood. 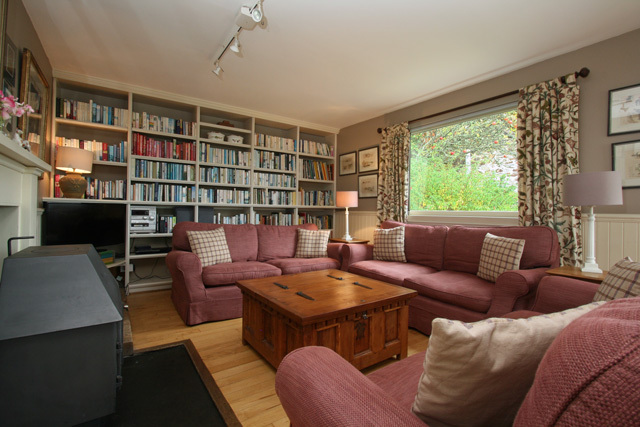 Creag Iolaire Cottage as an absolutely wonderful and very well equipped cottage. It is cosy, relaxing and situated in a most beautiful and peaceful area. The views are incredible looking high over Loch Ness and to the mountains. You can just relax and take in the scenery. We also loved the baby grand piano. We will recommend it to anyone who wishes to stay in the Loch Ness area and hope to make another visit. Thankyou. We arrived at Creag Iolaire at Loch Ness and were on top of the world when we saw the cottage, it had everthing you could wish for. The location couldnt have been better. We had our two little Jack Russells with us and had plenty of choice for walking and exploring. We saw snow on the first evening and woke up the next morning to a blanket of white making the view look even more romantic! We have been back for three weeks now and we are already longing to go back and take in more of the Highland scenery. All four of us had a really good time and will definately be returning for our next doggy holiday!! 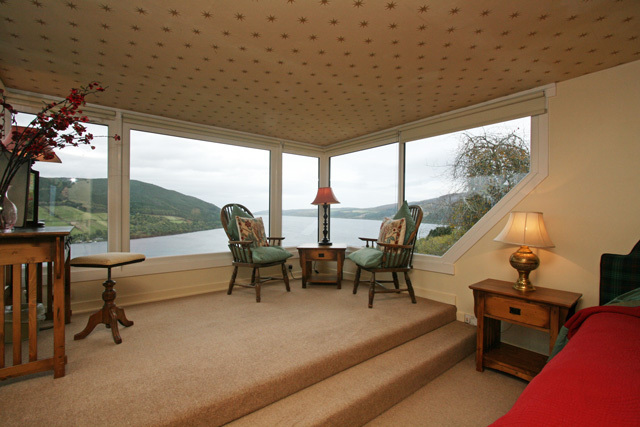 Stunning Cottage with stupendous views of Loch Ness. Comfortable and very well equipped with all we needed. We all enjoyed our stay and will go back. The baby grand piano was a bonus: we were able to tickle a few good tunes out of it. A stunning library of books meant we didnt read our own. Would recommend this cottage to everyone- we changed our dates in order to get it and we were very well rewarded. THE COTTAGE WAS VERY NICE,WITH FANTASTIC VIEWS OF LOCH NESS AND WAS VERY CLEAN AND TIDY UPON ARRIVAL.IT IS IDEAL FOR PEOPLE WITH DOGS AS IT HAS A FENCED IN GARDEN AREA AND SOME GREAT WALKS NEARBY.I WOULD RECOMMEND IT HIGHLY TO ANYONE INTERESTED. 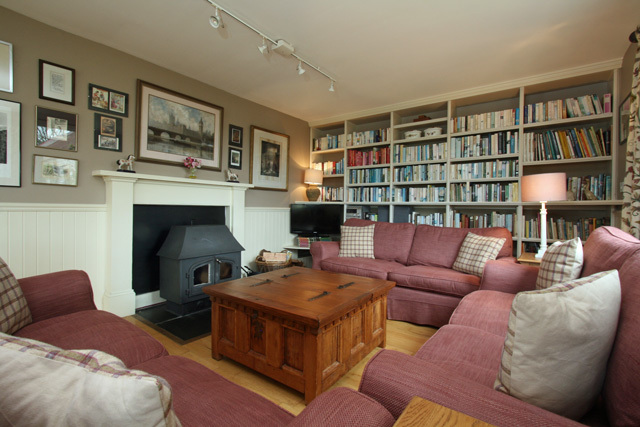 The location of this cottage was absolutely perfect and the views over the Loch and surrounding countryside outstanding. The cottage itself was ideal, very comfortable with everything we needed for a relaxing holiday. The internal layout of the cottage is truely wonderful giving fabulous views wether dining, relaxing and even from the bedroom. We will definately return.